Articles diy Are skin care products really useful? There is a saying that everyone can be a beauty and it seems true more than ever in today’s world. Nowadays, both boys and girls are taking skin care more seriously to make their skin smooth and to look young and pretty. A recent study showed that skin texture plays a significant role in the judgment of female facial beauty. Thus, it is not surprising that a girl can accumulate tons of bottles of skin-care products on her dressing table. 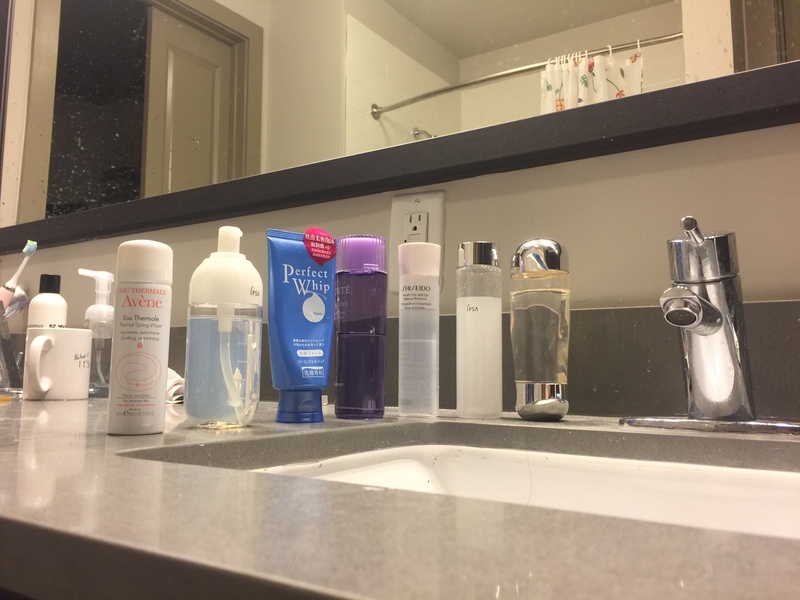 Even boys at least have one facial cleanser. In my own experience, I use a various of skin-care products because my face gets oily and grow pimples and acne easily. I need to be extra careful since my skin is so sensitive that if I don’t choose the right products, it turns red and itchy. I do worry about if there are some side-effects and whether these countless skin-care products that come from different regions all over the planet are useful or not. Let’s look at our skin structure first. There are three layers called the epidermis, the dermis and hypodermics in our skin. The layer skin-care products contact most is the epidermis, which it the outermost layer of skin, providing a waterproof barrier and creating our skin tone. What’s more, there are two layers of epidermis, the living basal layer, which is next to the external stratum corneum, or horny layer, which is composed of dead, keratin-filled cells that have migrated outward from the basal layer. Most of the exfoliators and cleanse products are dealing with the stratum corneum layer. Thus what skin care products actually can do is basic moisturizing, which is a totally physical function rather than chemical. Looking at the ingredients of moisturizing products, it is not hard to find mineral oils, synthetic oils, plant oils in order to soften and moisten skin. Glycerine and propylene glycol are used for moisture absorption. These ingredients help skin to stay smooth by preventing the loss of water and oxidization. Another important skin product is sunscreen and cream for isolating the UV and atmosphere pollution or dust. Krysta Biniek, a researcher in Stanford University wrote that “Although the ubiquitous presence of solar UV radiation in human life is essential for vitamin D production, it leads to skin photoaging, damage, and malignancies solar UV radiation poses a double threat to skin by both increasing the biomechanical driving force for damage while simultaneously decreasing the skin’s natural ability to resist, compromising the critical barrier function of the skin” . Products like skin whiteners have some serious side-effects. There is one study that showed that skin-lightening creams contained higher concentration of the studied metals than the moisturizing creams. Also, people who use skin-lightening creams are potentially exposed to higher concentration of metals. Last but not least, chromium was found at concentrations that can induce allergenic contact dermatitis in pre-sensitized individuals. Based on this finding, the ingredient of skin whitening products become extremely crucial. So next time when you go shopping, remember to take a look at ingredient list. Natural sources are much better than chemicals. There is also a scientific analysis that discusses advantages of natural sources. It says that “Although a number of hypopigmenting products have been developed, those from natural sources are preferred and will predominate in the cosmetics market. More active compounds such as phenols, flavonoids, coumarins and other derivatives have been identified from natural sources. This article summarized natural skin whitening products involving tyrosinase blockers like phenols and polyphenols, and non-tyrosinase blockers like α-MSH, melanosome transferase and cytokine inhibitors.” All in all,don’t forget to take a look at ingredients of skin whitening products when you are shopping. Generally if you want to have a glowing skin, the easiest way is try to get a nice DNA at the very beginning of your life. Just kidding! Don’t be fooled by flowery words in advertisements and stay away from those products which have impossible crazy functions. You can surely earn a great skin by choosing suitable skin product and clean, moist and put sun cream everyday. So I guess the magic to have a nice skin is your perseverance. Fink, Bernhard, Karl Grammer, and Randy Thornhill. “Human (Homo sapiens) facial attractiveness in relation to skin texture and color.” Journal of Comparative Psychology 115.1 (2001): 92. Biniek, Krysta, Kemal Levi, and Reinhold H. Dauskardt. “Solar UV radiation reduces the barrier function of human skin.” Proceedings of the National Academy of Sciences 109.42 (2012): 17111-17116. Iwegbue, Chukwujindu MA, et al. “Safety evaluation of metal exposure from commonly used moisturizing and skin-lightening creams in Nigeria.” Regulatory Toxicology and Pharmacology 71.3 (2015): 484-490. Lin, Jen-Wen, et al. “Natural products with skin-whitening effects.” Journal of food and drug analysis 16.2 (2008). Eileen is currently second year ISYE student at Georgia Tech. She is interested in math, art and sports.